Home » THINGS TO DO » Events » "Still in Eden: Connecting People to the Landscapes that Inspired Thomas Cole"
"Still in Eden: Connecting People to the Landscapes that Inspired Thomas Cole"
The Thomas Cole National Historic Site presents the 13th annual Raymond Beecher Lecture, featuring Ned Sullivan, president of Scenic Hudson. "Still in Eden: Connecting People to the Landscapes that Inspired Thomas Cole," will explore Scenic Hudson's work to protect the Hudson Valley's iconic landscapes and discuss the transformative impacts of the Hudson River Skywalk. The Skywalk provides a pedestrian pathway over the Rip Van Winkle Bridge, connecting visitors to the Thomas Cole National Historic Site and Olana State Historic Site. It provides an exciting new way to experience the homes and studios of Cole, founder of the Hudson River School of painting, and Frederic Church, Cole’s most famous student, as well as the magnificent views that inspired them. The lecture will be hosted at Joe's Garage on Main St. in Catskill (Greene County). See this page for tickets and additional information. 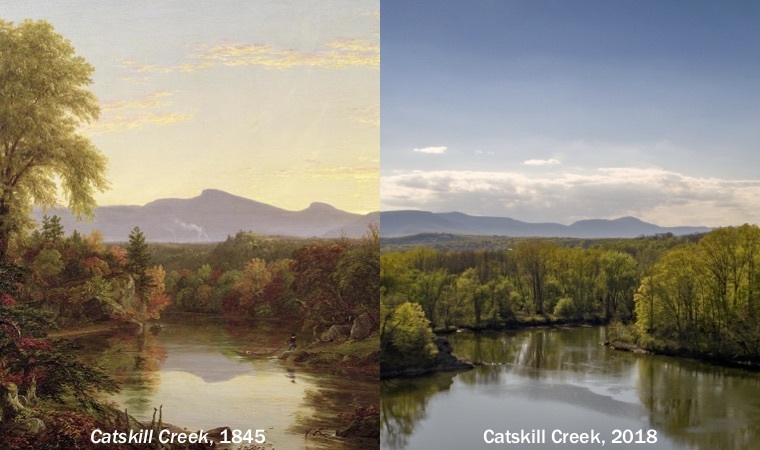 Thomas Cole's Catskill Creek (oil on canvas, 1845), compared with the same landscape today (now part of Mawignack Preserve).